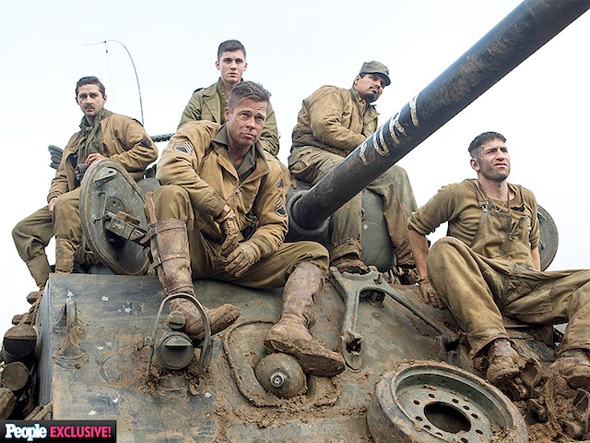 Following a stylish cast photo and some pictures straight from the set by way of director David Ayer, the first official photos from the World War II drama Fury have arrived. 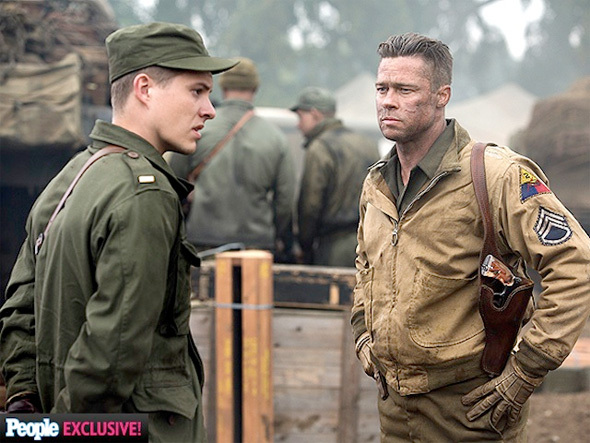 Brad Pitt, going by the name Wardaddy, leads an American tank crew in Nazi Germany, but he's probably not collecting Nazi scalps this time. However, he's surrounded by an impressive cast that includes Shia LaBeouf, Logan Lerman, Michael Pena, Jon Bernthal and Jason Isaacs. This has the potential to be one of the great movies that Ayer delivers as a director, especially with this talent in front of the camera. We're hoping for the best. Look! Written & directed by David Ayer (Street Kings, End of Watch), Fury follows a crew of Americans who embark on a brave mission. As the Allies make their final push, a battle-hardened army sergeant named Wardaddy (Brad Pitt) commands a Sherman tank and her five-man crew on a deadly mission behind enemy lines. Outnumbered and outgunned, Wardaddy and his men face overwhelming odds in their heroic attempts to strike at the heart of Nazi Germany. Shia LaBeouf, Logan Lerman, Michael Pena, Jon Bernthal and Jason Isaacs star in the film which Columbia Pictures has set for release November 14th later this fall. Definitley looking forward to this! Anything having to do with tanks and ww2 automatically makes me excited. Need to watch Patton. This cast is impressive...very impressive. Ayer has a great deal of potential as a director. This could certainly be a great achievement in his career. Bernanthal is pulling a SWINGBLADE! I hope they put behind the scenes edits in the DVD where Brad gave Shia a right hook. Id buy the Blu Ray on that reason alone. Fury co-stars three Jews (Logan Lerman, Jon Bernthal, and Jason Isaacs) and one half-Jew (Shia LaBeouf), yet none of the characters are Jewish. It's the kind of impressive cast of Jewish soldiers that Brad Pitt's Inglourious Basterds should have had. Instead, Quentin Tarantino cast a bunch of unknowns, most of whom weren't even Jewish.